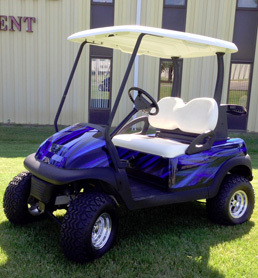 Century Cart Connections can customize any used golf cart to meet your needs/desires. 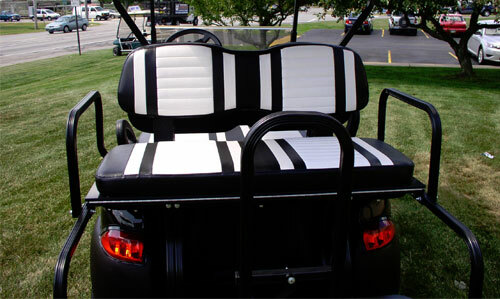 Our most popular upgrade is to add a rear facing, fold-down seat that turns a standard golf car into either a 4 passenger vehicle or a utility vehicle with a flat bed carrier. Adding headlights and taillights for use at night in neighborhoods or campgrounds. Brake lights and turn signals can also be installed. 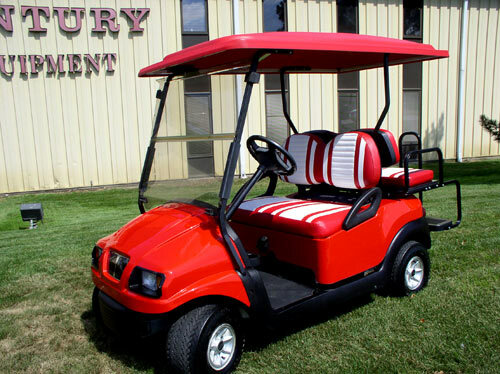 Changing out a cart’s original body and replacing with color coordinated body, seats and roof. Installing rear view mirrors or stereo systems. Installing a “utility box” to carry cargo. 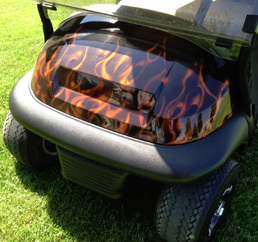 Creating custom painted designs on carts that gives the vehicle a one-of-a-kind appearance. Supplying and installing specialty items such as snow plows or mounted or towed salt spreaders. Solar panel battery recharging options for electric carts. Most accessories are carried in stock. Our service departments can install any item that you can find in a catalog or on the internet.